It’s now been three weeks since our automotive misadventure and life has pretty much returned to normal. It’s uncanny how events that seem momentous as they are unfolding tend to pale in their significance with the passage of time. The day after the accident had a touch of the surreal to it. Although we were up for close to 24hrs straight, we puttered about the house after finally arriving at home, too tired to actually go to sleep. When we did finally go to bed – around 4:30am – sleep descended like a leaden blanket. It was profoundly deep, but also surprisingly short. We got up before dawn to go on an early morning game drive in the hopes of seeing the elusive leopard. Alas, we saw no more of him than the day before – a tail wagging teasingly from the foliage while several dozen LandCruisers and matatu-style tour buses jockeyed for position along both shores of the densely wooded ravine where he was ensconced. It was a little after 10am by the time we breakfasted and packed the car for our return journey to Nairobi. It took us the better part of two hours to navigate the conservancy back roads and re-cross a sliver of the Maasai Mara Reserve to arrive at the rough road that would – after 80km – lead to pavement and the highway back to Nairobi. Seven or eight kilometers before we hit pavement the car suddenly swerved. D tried to correct the skid but to no avail. We fishtailed back and forth across the sandy surface before going off the road and crashing into a ditch. Thankfully no one was seriously injured. Still in shock, we surveyed the damage. It could have been worse, a lot worse, but it could also have been better. The entire left front wheel shaft was crushed and our back left tire was flat, rendering the vehicle undrivable. We called the Embassy and obtained a number for the local police in Narok in the hopes of getting a tow truck and a police report for the insurance company. Unfortunately, the police were less than helpful, which should not have been too surprising given their dubious status as Kenya’s most corrupt and inefficient institution. No one came to the site of the accident during the 3+ hours we spent on the side of the road, even though Narok was only an hour away. Attempting to arrange a tow through the police also proved a waste of time. Our police contact gave us a number for a tow truck, which after several phone calls turned out to be a tractor so far out in the field that four hours later it was still unavailable. When we called back to say that a tractor was not what we needed, the policeman handed the phone to someone who offered us a tow for an obscenely high sum of money and promptly hung up when we balked at the price. In the meantime, the batteries on our phones died. Fortunately, we had the presence of mind to write down all the numbers we could think of needing, including the one we had looked up for AA-Kenya, a roadside assistance service akin to AAA in the United States. With no charge left on either of our phones, we stopped waving off passing vehicles that slowed down to ask if everything was ok. Most were matatu vans filled with tourists on their way to the Mara. While it was nice that they stopped, there was little they could do, aside from giving us some water and cookies, as one thoughful couple did. Unexpectedly, all the help we needed arrived in the form of a LandRover that contained a driver/mechanic, painter, and electrician headed back to Nairobi. After two unsuccessful attempts, they managed to haul our car out of the ditch and helped us change the back tire. They also lent us a phone so that we could arrange for AA to tow our car. The only downside was that we’d have to wait for a tow truck to be sent from Nairobi, 155km away. Although D was hesitant to leave the car on the side of the road, common sense eventually prevailed and we accepted a ride to Narok. Our good Samaritan friends even went so far as to find a Maasai to stand guard over the car. While D charged our phones and tried to identify a reliable auto repair shop in Nairobi, S went to the police station in the hopes of obtaining an accident report. The Traffic Commissioner with whom she met was displeased that he had not been informed earlier (apparently our police contact was in a different department and had not bothered to talk with him) and that we were not following protocol. Despite not owning a vehicle, the police were expected to investigate the scene of the accident and were required to hold the vehicle for inspection prior to issuing a report. We had no intention of spending the night in Narok, much less getting our vehicle impounded, so we dispensed with any further assistance from the local police. The tow truck arrived just after sundown, laden – to our surprise – with large sacks of charcoal. “We always get charcoal when we have a job outside Nairobi,” the driver offered by way of explanation as he and his assistant slowly unloaded the sacks from the flatbed. Leaving Marni with our luggage in Narok, we squeezed into the cab of the tow truck and returned to the scene of the accident. Not only was the car just as we left it, but the Maasai had also kept his word. As we got out and approached the car, he sprang out of a nearby bush, bow & arrow and spear in hand. It took an hour and a half to load the car onto the flatbed (we can only speculate how long it would have taken had it been left in the ditch). By the time we deposited it at the auto repair shop it was past 3am and we had been awake for nearly 24 hours. Living in Nairobi for over a year, we’ve grown confident in our ability to navigate everyday life. It is only once we found ourselves in a really tough situation that we faced the reality of not being able to count on the basic infrastructure and professional competence that we take for granted in the United States. At home, we could have towed our car to the nearest city for repairs, resting relatively at ease that it would not be stolen or ransacked for parts. Here, the authorities proved to be more of a hindrance than a source of support, and it was through the benevolence of complete strangers that we received the help we really needed. 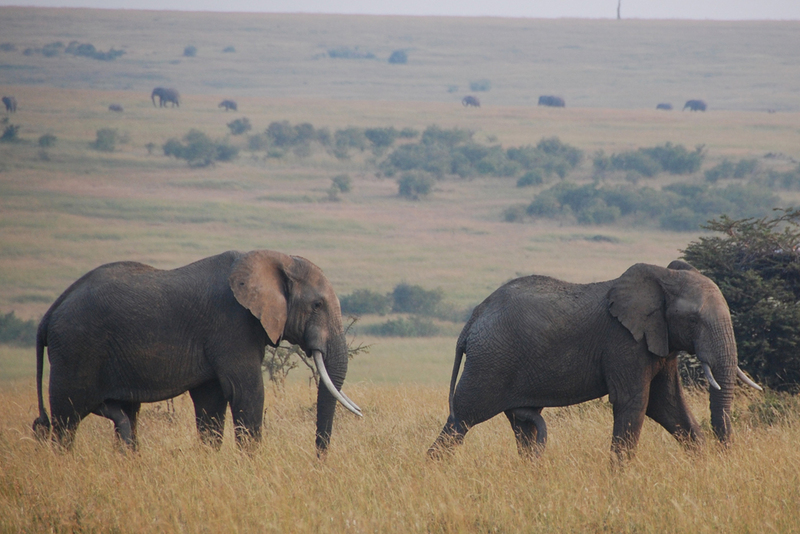 Our first visit to the Maasai Mara corresponded with the great migration. Although we only caught the tail end of it, thousands of wildebeest still roamed the plains, chewing on the remaining stalks of dried grass before braving the Mara River crossing in search of greener pastures. This time around, the migration had not yet started. The herds of wildebeest, several million of whom will soon take over this remote corner of South-Western Kenya, were still wandering around the Serengeti. The grass was high and undisturbed, and the endless plains seemed practically deserted. 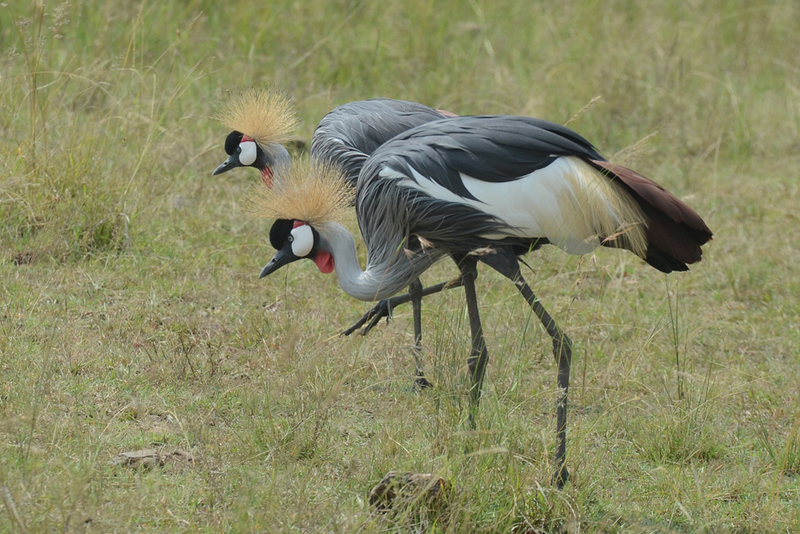 Having already written about the Maasai Mara, we thought it would be fun to do something a little different in describing our latest safari adventure. S’s friends from One by One, who joined us on our trip to the Mara with Marni, provided the inspiration for what follows. Some of these haikus were composed in the car, as we stalked elusive predators. The better ones were written collaboratively after the safari was over, as we sat around the campsite with G&T’s in hand. Thanks to Marni, Heidi, Jack, and Taylor for their help in crafting these. 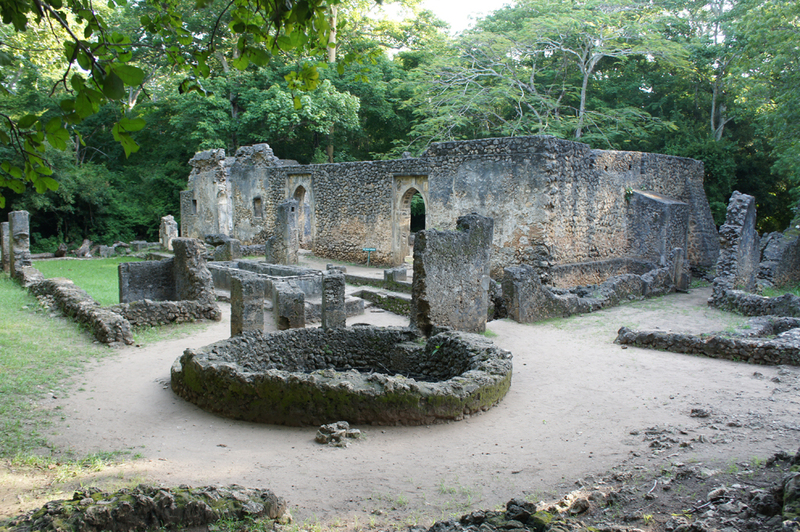 Leafing through her guide book, Marni stumbled upon a description of the “eerie and hauntingly beautiful” ruins of Gede, which are hidden away in a strand of forest not too far from the beach house we had rented in Watamu. D also found a reference to the ruins in Bill Bryson’s African Diary, which he had coincidentally plucked from the well-stacked bookshelf at the house. Intrigued, we headed to Gede late one afternoon, as the ruins are rumored to be at their most striking when they are lit up by the descending sun. In a recent NYTimes blog post, Tim Kreider extolled the virtues of idle time, arguing that too often we occupy ourselves with meaningless tasks that end up making us too busy to make time for what really matters – hanging out with friends, reading a good book, enjoying a movie or a show. On the one hand, the article felt a bit dismissive and condescending. Busywork is a lot easier to avoid if one is a writer who feels that “four or five hours [of work] is enough to earn [one’s] stay on the planet for one more day” than if one has a structured job and has to report to a boss. Rebelling over every menial and unimportant task one is assigned would not get one far in the corporate or government workforce, from which many of Kreider’s readers undoubtedly come. One of the most challenging aspects of adapting to the Foreign Service lifestyle is the difficulty of sustaining friendships. It’s not just the friends one leaves behind. With relatively short tours and a constantly rotating cast of neighbors and coworkers, it is tough to develop meaningful relationships that stand the test of time and distance. Given the size and diversity of Nairobi’s expat community, we have found ourselves trying to make friends with new arrivals at the same time that we attempt to integrate into an existing social fabric comprised of people who have spent half a decade or longer in Kenya. There are times when life simply becomes too full. The beginning of July tends to be such a time for many in the Foreign Service, as embassies around the world organize massive events to celebrate our nation’s independence. This year, D also found himself assigned control officer duties for a 21-person CODEL (Congressional Delegation) whose arrival on the night of July 4th coincided with that of our friend Marni. As a result, the last two weeks have been packed with so many incidents, both fun and challenging, that it’s been difficult to find the emotional space and distance to process it all, much less the time to blog about it. As we catch up with our thoughts, we look forward to sharing more of our adventures and misadventures soon. Last weekend, D joined seven other would-be Swahili speakers of varying skill levels for a language immersion retreat, improbably held at a golf & country club near Lake Naivasha. Unlike in neighboring Tanzania, where the de facto official language is Swahili, language immersion in Kenya is difficult to achieve. Swahili is one of two offical languages in Kenya, but government business is pretty much exclusively conducted in English. In informal settings, on the other hand, Kenyans are much more likely to use their native tribal tongue than Swahili, especially if one leaves the metropolis and travels upcountry to more homogenously populated villages. Even when people speak Swahili – and they do quite often – they pepper it with words from other tribal languages and intersperse their speech with expressions borrowed from Sheng, the ever-shifting slang of Nairobi’s slums.